For a long time, business-to-business (B2B) marketing has valued events as a solid way to generate new sales leads. But research from Sagefrog Marketing Group shows that B2B marketers are augmenting that traditional method with a digital-minded approach. In its October 2017 survey of US B2B marketing professionals, Sagefrog found three of the top four areas of marketing spending were digital in nature. In fact, website development topped the list. 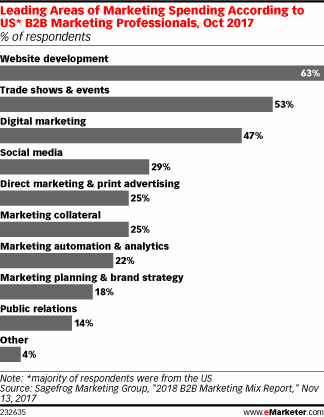 But the old mainstay of face-to-face tradeshows and events was the second most popular answer, followed by digital marketing and social media. In another sign of the ascendance of digital marketing techniques, Sagefrog also found that email and social media were tied as the most commonly used marketing tactic, employed by 79% of respondents. Tradeshows and events were used by 59%, but the next three most popular marketing toolsâ€”search engine optimization, blogging and online display advertising/pay-per-click (PPC) advertisingâ€”all fall squarely in the realm of the digital. The objectives of marketing were largely what one might expect them to be, according to Sagefrog. The firm found that sales lead generation was a high priority for 67% of respondents. Converting leads to customers was the second most important goal for marketers polled, named as an objective by 47%. Thatâ€™s an interesting outcome, considering the latter task has previously fallen largely on the shoulders of salespeople. It may also be a reflection of a sales funnel that has been disrupted from its traditional structure thanks to the rise of digital marketing tools. eMarketer has also found that B2B marketing efforts are getting more complex. Where they once focused strongly on lead generation, marketing campaigns are now also being complemented by account-based marketing, in which B2B firms focus personalized efforts on high-value accounts to drive revenue growth. Copyright 2017 eMarketer Inc. All rights reserved. From https://www.emarketer.com. By Rahul Chadha.